This month we're in for a real treat as the Source Market Hall opens its doors to Internations. The former iron foundry is now home to 25 independent food and retail vendors and 2 top breweries. Our hangout for tonight is the newly opened bar Isabel. Isabel showcases beverage creation first-hand by its daytime juice and evening cocktail program. As nighttime descends, Isabel transitions to full cocktail service. 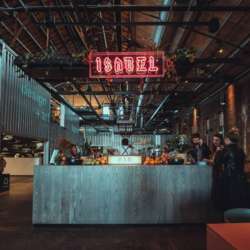 Isabel's staff infuses spirits in real-time, blending fresh fruit and juices into boozy concoctions and juicing citrus to order by hand. Please register for this event by clicking the Accept Invitation button. Feel free to bring your international friends and co-workers, and don't forget to invite them to sign up for InterNations too!